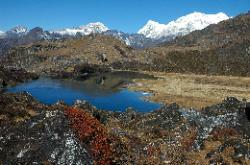 The vast diversity of India's smallest state can be best experienced during a trek in Sikkim's western district. Before setting out on the 12-day trek, I spend some time in Gangtok, the state's capital. It is a good place to start preparing for the trek: clear mornings reveal the first views of the mountains, most prominent is Kangchenjunga, the 8'858 m high seat of Sikkim's protector deity. 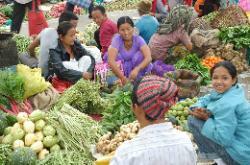 During a visit in the market the ethnic diversity is striking; Lepchas, Bhutias, Tibetans, Nepali and Indians call Sikkim their home. During the half-day jeep-ride to Yugsom we drive through dense forests along mighty torrents and pass countless clearings where rice is growing on steep terraces. The monsoon rain stops just in time as we start the trek in Yugsom. It is hard to be lieve that the sleepy village was the place where the kingdom of Sikkim was founded in 1641. We climb through dense forest up to the high-altitude grazing area near Dzongri. Sunrises from there spectacular; while the Indian plane lies in the shadow the ice-clad massif rises above the mist and catches the orange rays of the sun. The next few days we climb up higher in the Prek Chu valley in the direction of the the stupendous eastern wall of Kangchenjunga. 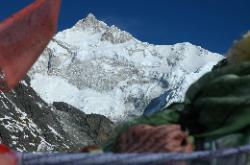 Rising early, we set out for Goeche La pass at the foot of Kangchenjunga. While passing green glacial lakes below hanging glaciers, avalanches thunder down the steep ice-clad flanks of the "lesser" 6'000m peaks that surround the higher summits. Finally, after a tough climb through snow, we stand at the top of the pass at roughly 5'000 m and enjoy stunning views and a well-deserved rest. Instead of going back the same way, the head south-east and stay at the beautiful lake of Lam Pokhari where the mountains reflect on its water and ice. From there we walk on a ridge with fine views of Ratong, Kabru and Kangchenjunga before descending steeply into the forest. Though we do catch good views of the glaciers through the foliage, we are already in a different world. Moss covers the trunks of large trees, orchids grow in their branches and when we hit the rice fields we know we will soon reach Labdang, the first village since Tshoka and the end of the trek. Via Tashiding we drive back to Gangtok. Hishey from Discover Sikkim trekking agency (email: tdomaATyahoo.com) for setting up a fine trek with excellent crew at such short notice.